Today’s reviews are the new word of mouth, the most effective marketing tool ever to exist. Use our WordPress review plugin to display your best reviews from platforms like Google, Yelp, and Facebook right on your website. 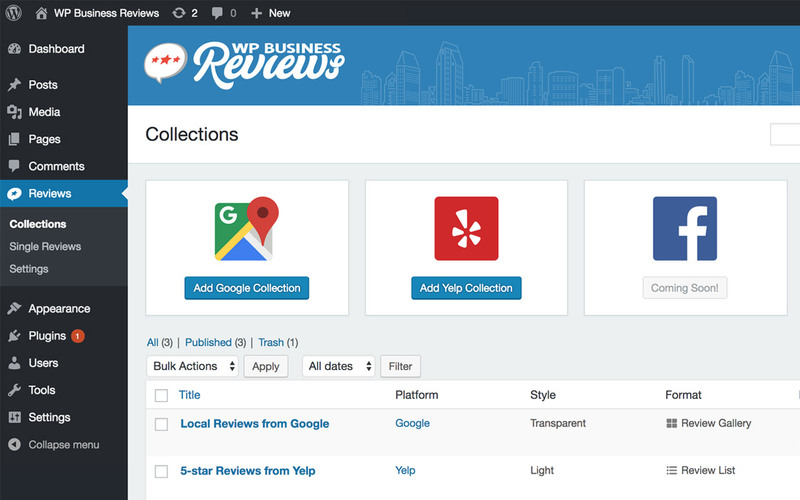 WP Business Reviews lets you showcase your reviews so you can promote your best customer experiences. Mashup reviews from multiple platforms or display reviews from just one. 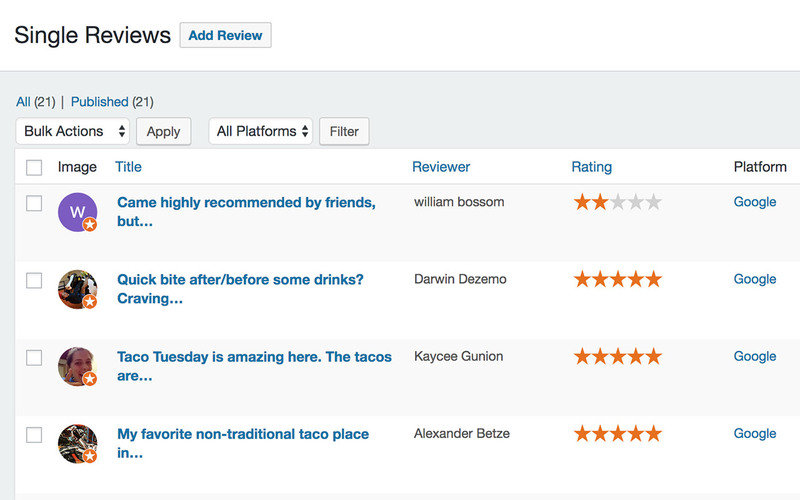 Filter negative reviews, add custom reviews, and display them in a beautiful layout. 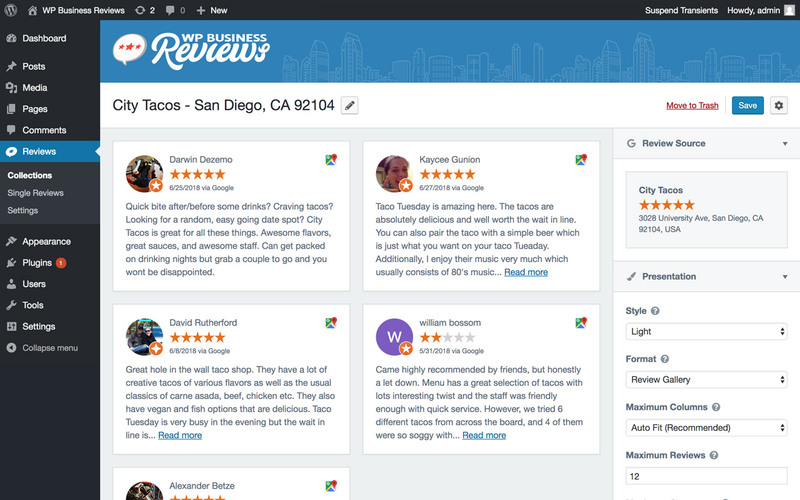 Our user interface makes building your collection of reviews intuitive and fun. Organize your reviews by tag. Tweak the style and format of their presentation. Then embed those reviews right on your WordPress site. We’ve built a powerful user interface that allows you to search, style, and sort your reviews directly from the WordPress dashboard. Collections allow you to group reviews together, while still offering control over each individual review. Choose between a light, dark or transparent style and select from multiple display formats. Create a clean layout by taking control over the length of the excerpt posted from each review and toggling the review components to best suit your needs. Never display a negative review again. Set the minimum rating allowed and ensure that only your best reviews are promoted on your website. In addition to displaying reviews from popular platforms like Google, Facebook, and Yelp, you can manually add custom reviews so no feedback is left behind! Gain control over where your reviews are displayed on your WordPress website. We’ve included easy-to-use widgets and an intuitive shortcode builder. Any size business can benefit from our business review plugin. No matter what level you’re at, we have a plan that’s right for your budget. The most robust WordPress review plugin available, WP Business Reviews supports the most prevalent review platforms right out of the box. We’ve included Google, Facebook, Yelp, and Yellow Pages, with many more coming in the near future. Google leads the way in SEO, so it’s only natural that reviews from Google help provide a boost in your local SEO rankings. Boost your SEO and provide consumers with social proof straight from their local community by displaying your reviews from Google. Facebook is one of the fastest growing social media platforms around. Recently they’ve ramped up their review platform so now all pages can be reviewed. Display your reviews from the world’s more popular network right on your WordPress website. Yelp helped to pave the way for word-of-mouth marketing and remains one of the most popular review platforms around. Great Yelp reviews can positively impact purchasing decisions, especially with restaurants and other service-based businesses. Yellow Pages adapted to the modern era with online reviews. Its heyday is not over! YP remains a reputable and popular brand, especially among the baby boomer generation. 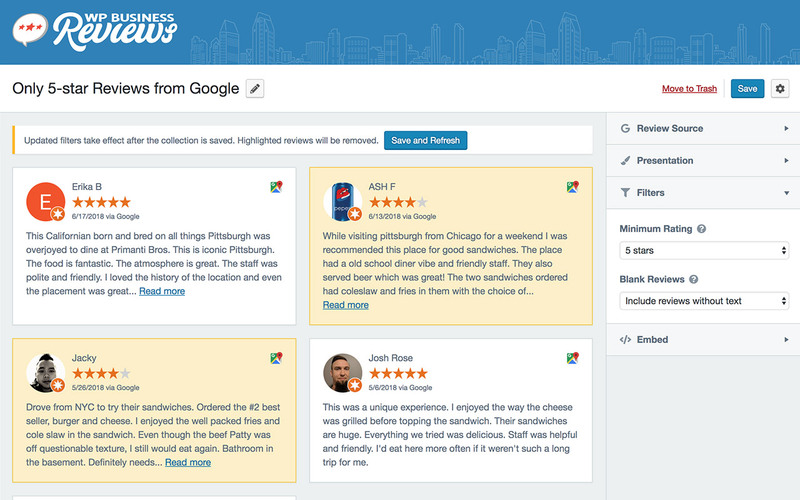 Displaying reviews from YP will help engage a broader audience online. WP Business Reviews is under active development with new features on the way. Sign up to be the first to hear about them. Looking for more licenses? Let's chat! We offer big discounts for our bulk licensing customers. Let us know more about how many you're looking for and we'll get right back to you.